Sprinkle 1/2 of the herb packet, 2 tbsp. wine, and 2 tbsp. oil over chicken. Toss to coat. (This can be marinated beforehand.) Bake chicken in covered roast pan with chicken broth for 45-50 minutes. Meanwhile, bring a medium pot of salted water to boil and set aside a bowl of ice water. Cook greens for 3 minutes. Do not drain water, use a slotted spoon to transfer greens to ice bath. 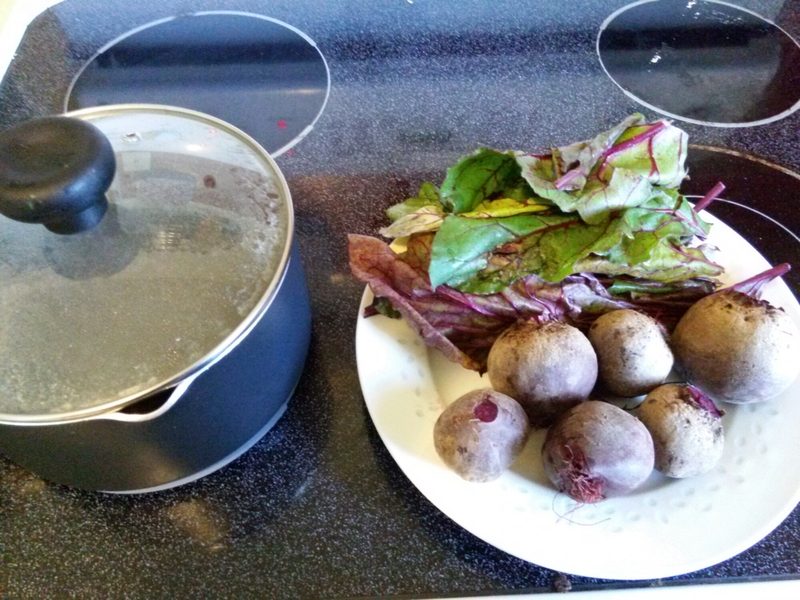 Return water to boil and cook beets for 10 minutes. Remove and allow to cool. Drain greens and set aside. 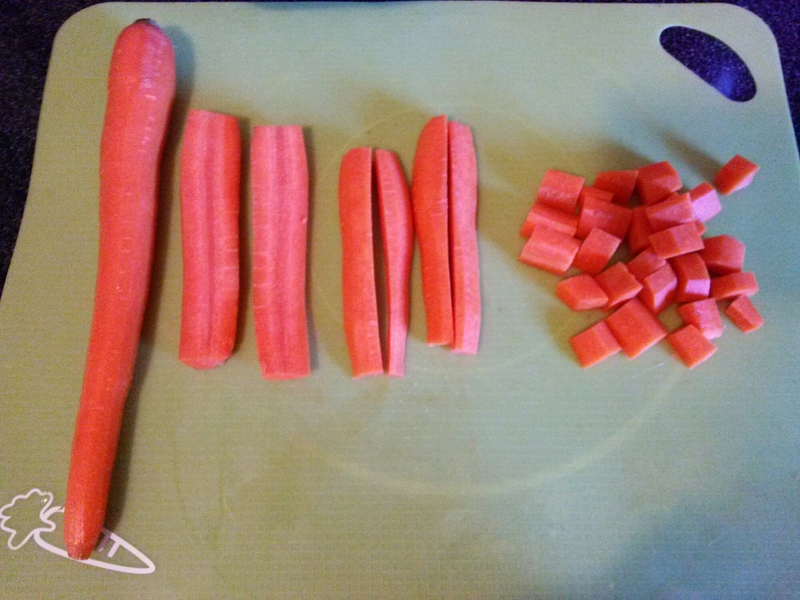 Peel carrots and cut lengthwise, then again to form strips. Dice into small dices, about a two inch dice. Cut off the “neck” of the butternut squash and save the bottom half for another use. Peel and dice just as carrot. Wash and scrub potato. I prefer to leave skin on, but if desired, peel and dice. Chop onion in same dice. Using a peeler remove skin from beets and dice. Keep in mind beets “bleed”. l didn’t use gloves, I just used bleach to clean my hands and cutting board. 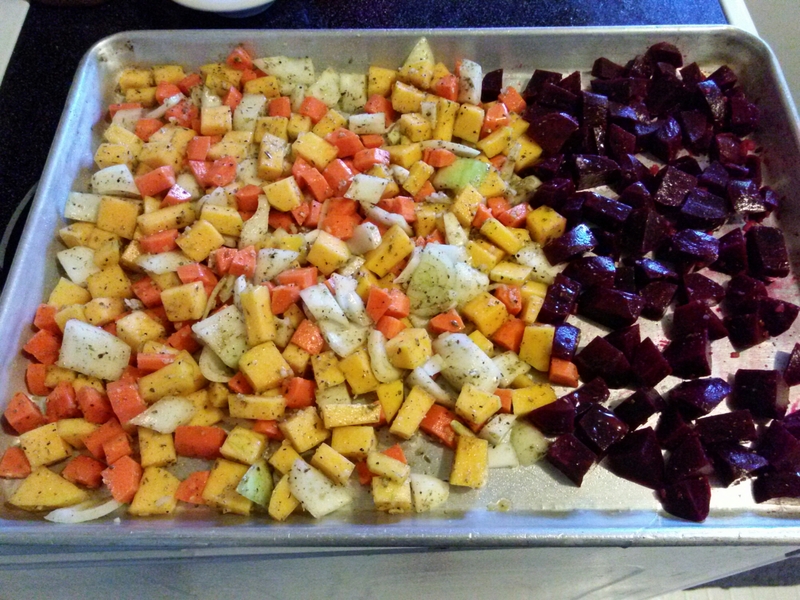 To minimize the beets staining the other veggies keep separate even in cooking until time of serving. Sprinkle 1tbsp of seasoning and 1 tbsp. oil over beets and lightly toss. Sprinkle remainder of spice on veggies and toss with 2 tbsp. oil. 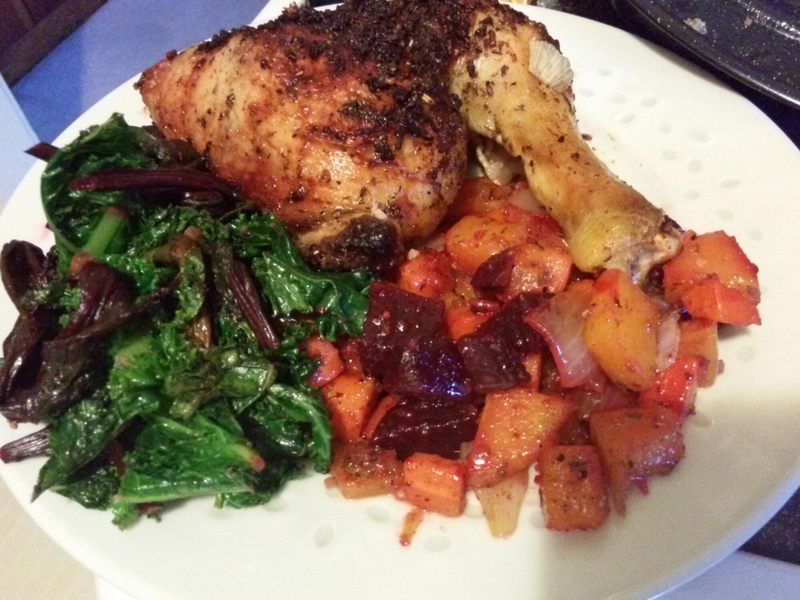 Spread veggies onto a large sheet pan lightly sprayed with non- stick spray, leaving a space for beets. When chicken has about 25 minutes left, place veggies in oven, flipping halfway through. Try not to mix beets. I also drained some of beet juice off the corner of my pan. Veggies should be tender and chicken needs an internal temp of 180°F. Before serving, stir to incorporate beets. To serve greens, heat a pan lightly drizzled with olive oil. Sauteed greens until just heated through, add garlic, salt and pepper and a splash of red wine vinegar. Serve with fresh lemon if desired. ← Mush, Music and Mutts.